Pope says he’ll canonize Junipero Serra in U.S. ABOARD THE PAPAL FLIGHT FROM COLOMBO, Sri Lanka (CNS) — The pope opened a news conference aboard his flight to a papal visit in the Philippines with an unsolicited statement about his decision to canonize St. Joseph Vaz, a 17th- and 18th-century missionary to Sri Lanka, without going through the usual process, including verification of a second miracle attributed to the saint’s intercession. Pope Francis said St. Joseph was one of a series of great evangelists whom he planned to canonize without such preliminaries, in an effort to celebrate the practice of evangelization. “Now in September, God willing, I will canonize Junipero Serra in the United States. 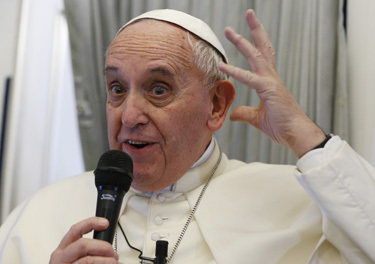 He was the evangelizer of the west in the United States,” the pope said. The pope has confirmed he will visit Philadelphia for the World Meeting of Families in September, and has suggested he might travel to New York City, Washington, D.C., and Mexico City on the same trip, but no itinerary has been released. His announcement of Blessed Junipero’s canonization is bound to raise expectations that he will also visit the southwestern U.S. The Franciscan priest established 10 missions in what is now California and Mexico.